UNITED NATIONS, June 27 -- Rwanda has complained to the UN Security Council that UN Peacekeeping chief Herve Ladsous requested and carried out a travel ban waiver for FDLR leader Gaston Iyamuremye / Rumuli Michel. Inner City Press has obtained the complaint letter, on which it first reported yesterday, and puts it online here. 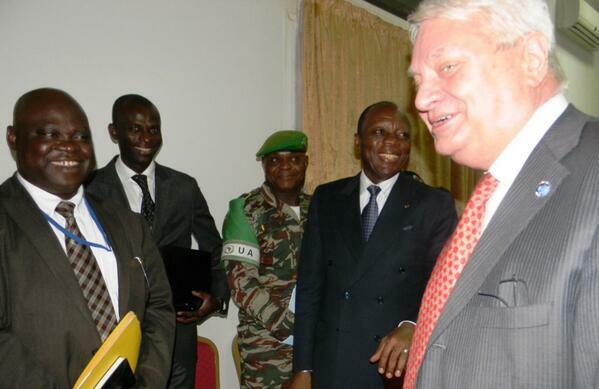 The letter recounts irregularities in Ladsous' last-minute request, including that his MONUSCO mission under Martin Kobler effectuated an airlift to Goma and then to Kinshasa on a MONUSCO aircraft even as the request was denied by the 1533 sanctions committee. The accusation is of a "hidden agenda of sanitizing the FDLR genocidaires." Despite a request to UN spokesman Stephane Dujarric yesterday for the UN's explanation, no response has been received. We will have yet more on this. There has still been no answer. Watch this site.